These are my most recent pair of trainers and as you can probably tell from this post, I'm in love with them. I've only worn them around 3 time because on the first day they gave me the worst blisters and my feet are still recovering. Probably should have waited and broken them in before wearing them for a full day but what can ye do. I bought these 3 years ago and I still wear them to this day, they're so beaten up and dirty (to the point where the 'white' bits are yellowing) they are such a classic pair of shoes. Only :/ with these is that the laces are looooong so I have to tie them around the back but eh idk I kinda like the look. The dustiest pair of trainers I own. Hands down my most worn pair of shoes, I wear these to sixth form everyday to the point where the suede is beginning to rip in one area. They are very comfy (hence why I'm always in them) and again, they go with all my outfits whether that be jeans and a t-shirt or even skirts. my OG shoes. What are your go-to shoes? 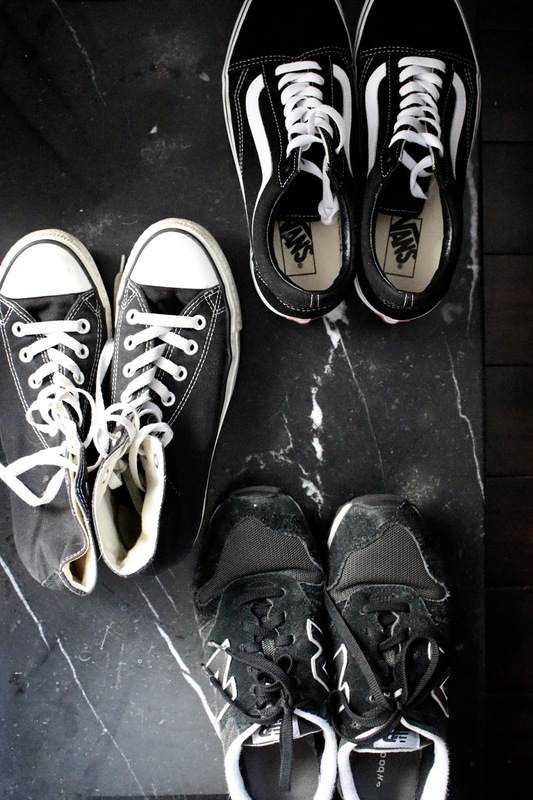 Do you gravitate towards trainers or other types of shoe? So many people bought them at one point and all I'd see is seven pairs of Vans around me, I kinda joined the hype when it died down though. I love them! Thank yoouuuu! I don't even think I have a pair of coloured trainers anymore, I'm so boring- your purple hair is fab. These are so similar to my most worn shoes, can't beat classic black trainers, so comfy and so easy to style. I love all of these, especially the vans old schools!